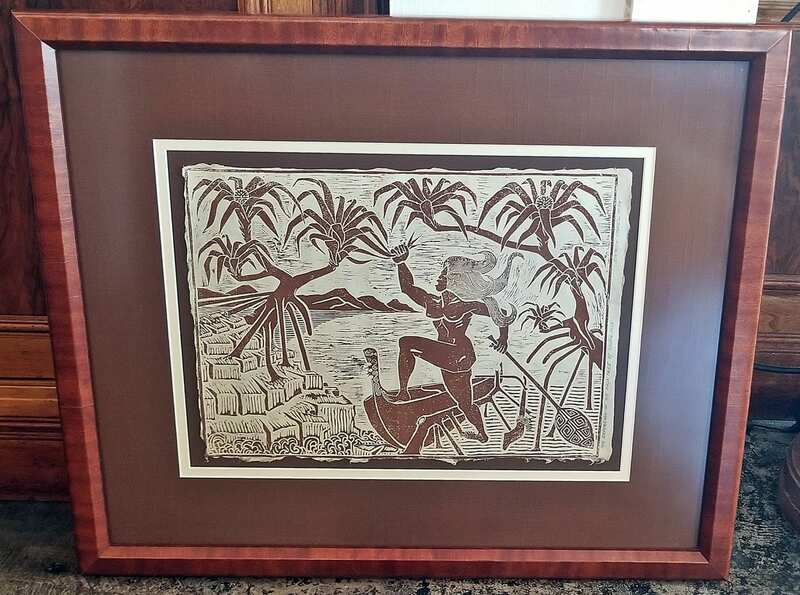 1979 Hawaiian Wood Block Print by Dietrich Varez. 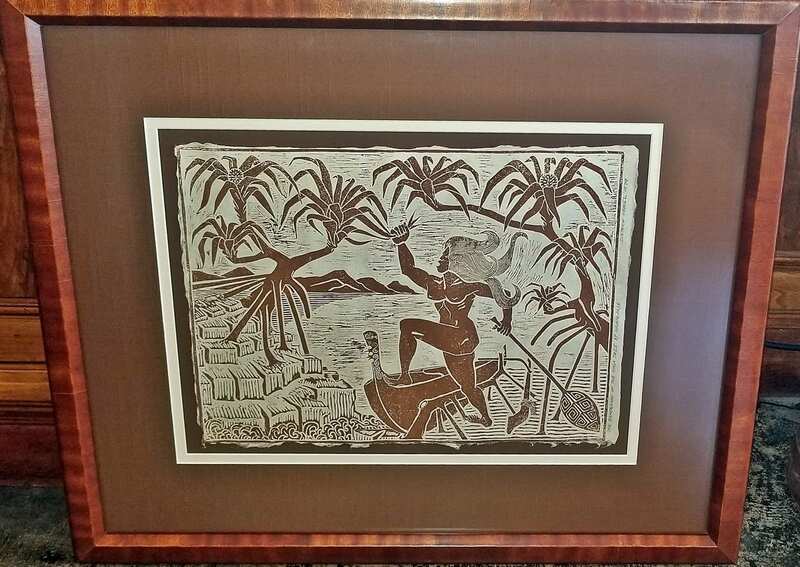 PRESENTING a Lovely large sized Wood Block Print, by well known American/Hawaiian Artist, Dietrich Varez, in beautiful original wood frame, from 1979. Mr. Valez recently passed away so his artwork will most definitely increase in value and significance. Titled: "THE DISPERSION OF THE HALA TREE BY MADAM PELE"
HIGHLY COLLECTIBLE …. 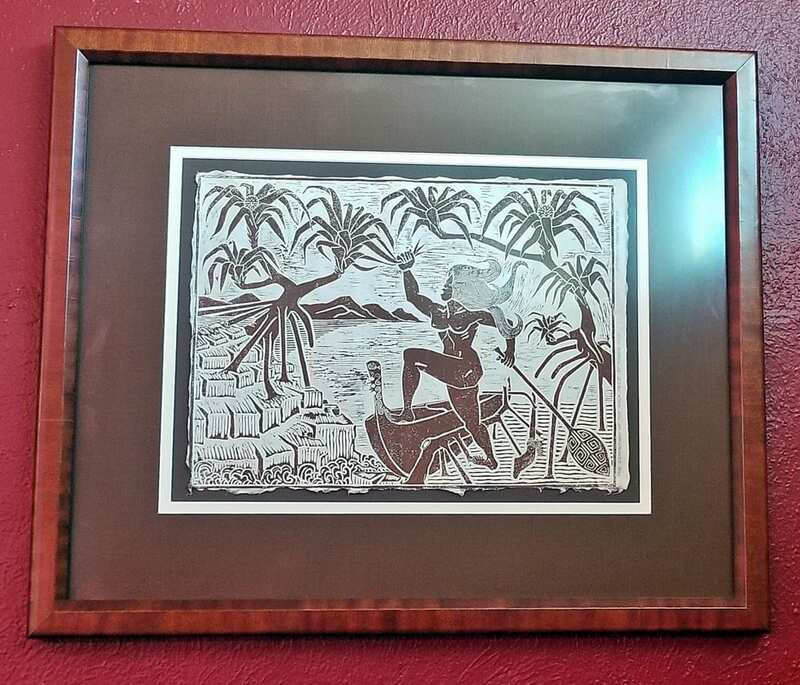 excellent piece of decorative Hawaiian art! In an era in which the fine arts and crafts have become a big business, Dietrich Varez remained an outstanding exception. Dietrich came to Hawai‘i at age 8, when his mother married his stepfather Manuel Varez. After the war-torn Germany he’d known, it was love at first sight, and his romance with Hawai‘i grew. 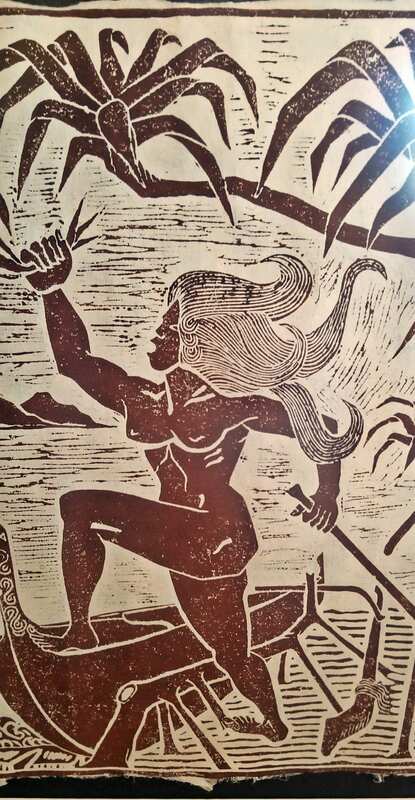 Shunning publicity and working in the simplest possible fashion with linoleum blocks, Varez continually shaped his strong personal expression of Hawai‘i. By nature a quiet and retiring man, he lived with his wife Linda (a noted painter) in a remote rain forest setting near Volcano Village on the Big Island. Isolated by several miles of bad road, he was able to maintain the tranquility he desired for his work. The Hawai‘i of old—when spirits inhabited every tree and stone, and gods walked the earth—was Dietrich’s inspiration. His work boldly traces the adventures and passions of a cast of mythical characters he carefully researched in legend. 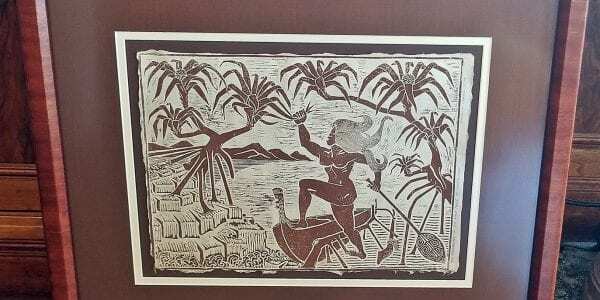 He lovingly and faithfully depicted Hawaiians practicing the arts, skills and values of old Hawai‘i. The Dietrich Varez catalog contains a wealth of knowledge and could be called “Old Hawai‘i Illustrated”. For many years, Dietrich worked as a bartender and did his art only in his off-hours. Initially he carved bas-reliefs and gave them away to friends. 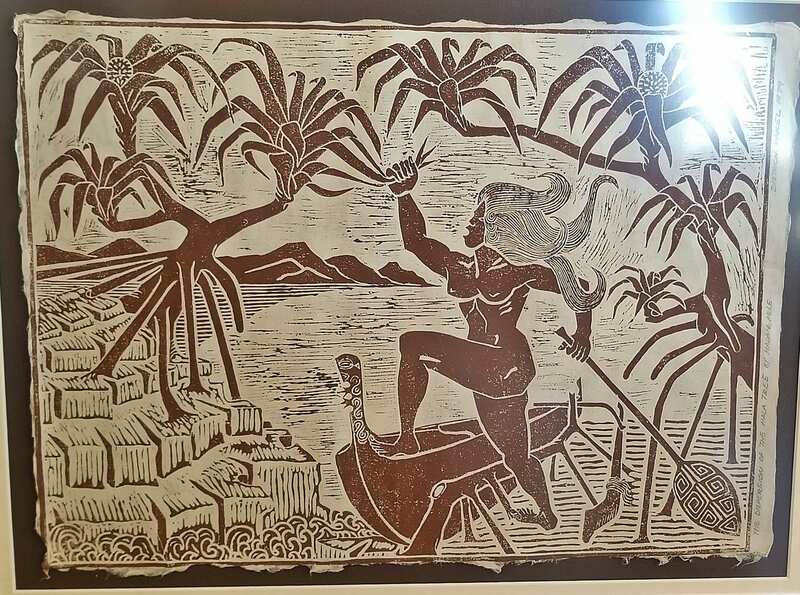 “But,” he says, “that got out of hand, so I carved a woodcut and found I could print lots of copies.” In 1974, when the Volcano Art Center Gallery first put his prints on sale for $2 each and sold seven in the first month, his life as a full-time artist began. The gallery now carries 227 Varez prints and has sold hundreds of thousands of them. Beloved artist Dietrich Varez passed away on August 14, 2018 at sundown to a beautiful sunset similar to his original paintings. His spirit will live on through the many artworks he created in his lifetime. Provenance: From a DFW (Originally Los Angeles) Private Collection.